GoPro cameras have pretty much become a part of every day life. When they’re not attached to bike helmets and car dashboards so that we can watch traffic accidents, they are being held on a stick by people jumping off buildings and various other dangerous activities. Like chasing sharks. While out surfing in Manhattan Beach in California, Michael Davids saw a Great White Shark. Instead of doing what any normal human would do and shitting himself, he decided to film it with his GoPro and follow it. 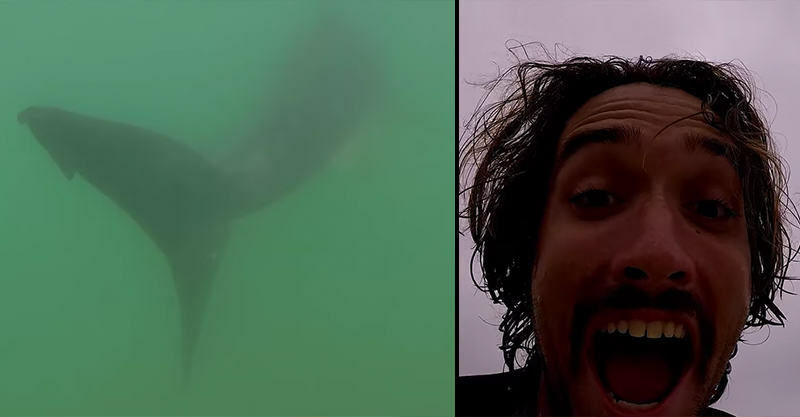 He followed the 7ft shark for a while before it swims off, then he filmed his grinning face. Hasn’t he seen Jaws?! ?